Its back to basics for this comics reporter this week with a throwback Thursday Triple-Shot! What’s better than some single issue comic reviews to get you out to the store this week and enjoy that spring weather. Matt Hawkins (Top Cow President, Think Tank) safecracks his way into a mega-church with The Tithe #1 and Larry Hama (G.I. Joe, Wolverine) takes on Batman and the classic Dark Knight substitute Azrael in Convergence: Shadow of the Bat #1. The fine folks over at Dark Horse let us have a sneak peak at Cullen Bunn’s Harrow County #1, mentioned in our interview a few weeks ago! The Tithe refers to the 10% donation of wages donated to a church or religious organization. Actually, there’s a verb form of that word as well as a noun, and the tradition is ancient so don’t come after me with pitchforks if I’m only slightly correct! Last year, we talked with Top Cow President Matt Hawkins about his spy-fi comic Think Tank. I enjoy listening to Matt’s views on comics creation and running the Top Cow brand in various podcasts and interviews. 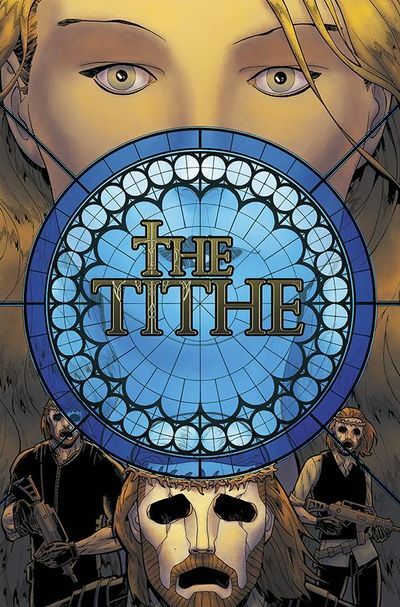 Matt and artist Rahsan are at it again with The Tithe. Three armed robbers invade one of those Disney mega-churches at Sunday mass in Jesus masks. In the front of house, a young lady highjacks the television screens a la ‘Anonymous’ with images of the pastor Miles Tibett in ungodly compromising positions and spending the churches’ money on extravagances. This organization is called “SAMARITAN” on the teleprompter signoff. This is at the heart a great heist story, with religion and mega-churches as the playground. The FBI investigates SAMARITAN and other misallocated and tax-free accounting from the church with two very cool and opposite leads. Dwayne Campbell, a Baptist and believer is a family man. His partner Jimmy is a younger dude, a ‘hacker’ (apologies, not even Mr. Hawkins has a better name for this kind of computer savvy security breaching tech nerd gone good) and an atheist. As what follows traditionally in Matt’s creator-owned books are some essays, behind the scenes to his research and a bit on his background as a former churchgoer turned atheist.